USC’s women’s tennis team picked up two crucial wins this weekend to move into sole possession of fourth place in the Pac-12 conference heading into the end of the regular season. The No. 13 Women of Troy (16-6, 7-2) recorded wins over No. 19 Arizona State and No. 25 Arizona over the weekend at Marks Stadium in a victorious final homestand. 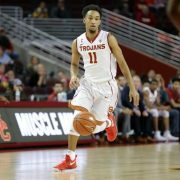 USC came into the weekend trying to get back on track after suffering back-to-back losses at the hands of California and Stanford. Head coach Richard Gallien was impressed with his team’s ability to bounce back from the losses with two wins this weekend. The Women of Troy started off the weekend strong against the Sun Devils (18-6, 4-4) on Friday with a 4-2 victory. Since junior Sabrina Santamaria suffered a season-ending ACL injury in March, Gallien has used a slew of different lineups, which has made it difficult for the team to get into a groove. 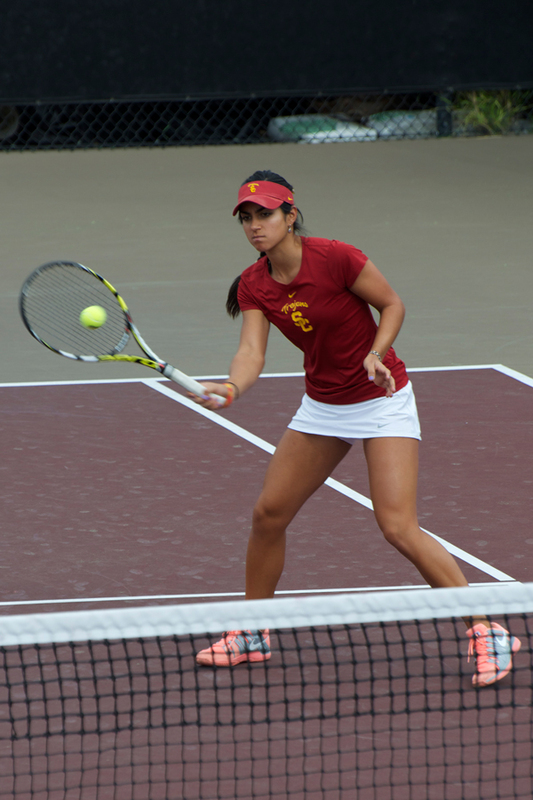 USC’s doubles teams found their footing on Friday. Junior Gabi DeSimone and freshman Zoë Katz raced to an 8-2 victory on court three to get the Women of Troy on the right track. Next, senior Brynn Boren and junior Giuliana Olmos, playing on court two, clinched the doubles point with an identical 8-2 score to put USC ahead 1-0. Olmos, ranked No. 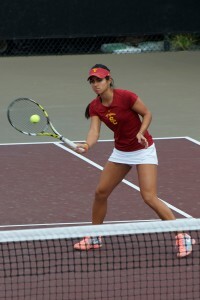 76 in the nation by the Intercollegiate Tennis Association, continued her success in singles, increasing USC’s lead to 2-0 with a dominating 6-3, 6-1 win over her opponent on court five. ASU would close the gap, though, when No. 49 Desirae Krawczyk topped Boren on court two. DeSimone put the Women of Troy up 3-1 with a 6-2, 6-3 victory over her opponent, but the Sun Devils kept it close when Kassidy Jump defeated senior Kaitlyn Christian. 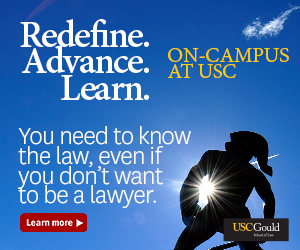 With the score sitting at 3-2 in USC’s favor, No. 26 junior Zoë Scandalis clinched the match for the Women of Troy with a hard-fought 7-5, 6-4 win over 68th-ranked Stephanie Vlad on the top singles court. 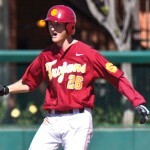 USC closed out its regular season home slate with a sweep of Arizona (16-5, 5-4) on Saturday. The Women of Troy came out of the gates strong, clinching the doubles point to go ahead 1-0. This time, Scandalis and Christian took home an 8-2 win on court one before Boren and Olmos topped their opponents, 8-4. Once again, DeSimone, Olmos and Scandalis carried their team to a victory in singles. DeSimone crushed her opponent by a 6-1, 6-1 score to put USC ahead 2-0. Next, Olmos dialed up a convincing 6-0, 6-2 victory on court five. For the second day in a row, Scandalis clinched the victory for the Women of Troy with a 7-5, 6-4 victory. Gallien praised his team’s ability to fight through injury and beat two top-25 teams over the weekend. USC must now prepare to take on UCLA to end the regular season. The Bruins have come out on top in the teams’ two previous matchups this season, but Gallien insists his team will play to win. USC takes on UCLA Friday at 12:30 p.m. in Westwood, Calif.
Podcast: Can the Trojans tame the Wildcats?